I have been thinking a lot lately about places and things I would like to do in my city. A local real estate agent is doing a project 365 on all the things you can do here as a way to show potential customers why this place is so great. I think it is brilliant and has given me so many new places I need to explore. I have lived in my city for just over 2 years and seeing this post on all the places made me realize how behind I am with all the wonderful gems there are here! I want have to see these things, so I have decided over the next 4 months (Til the end of 2014 folks) I want to cross off as many of these things as possible. Thankfully there are a mix of things that can be done indoors and outdoors so I can achieve the outdoor ones first while the weather is still good and once winter comes I will have to move it indoors! You should join me! Explore your city. Now I will probably go back and add to this list as I go because I am sure I am missing some key things. All of these categories can be achieved in my area. I can't wait to share some of my experiences with you all over the next 4 months! 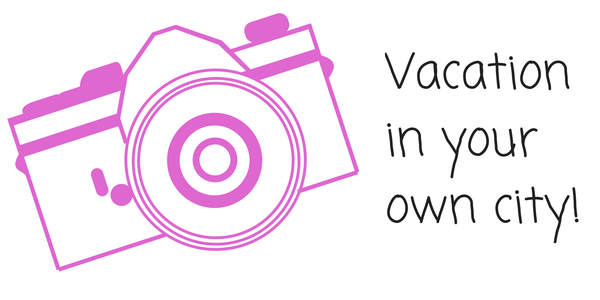 Have you ever "vacationed" in your city? How was it? Share your links or experiences! I think it's so neat to find cool things in your own backyard. Can't wait to hear your experience! Fantastic idea! I really ought to do the same... my town was apparently a fairly big deal for the Underground Railroad during the Civil War... there's supposed to be some museums and stuff, but I've not made it to any yet. Maybe I will work on that soon! I think it's so much fun to see where you live. It would be so much less stressful than a real vacation! That's really cool about the underground railroad stuff! I love playing tourist at home! Drives my husband a little crazy, but I love seeing all the neat places close to home. I think I am going to love it. I always pass places and think I need to stop and never do. This will be a good challenge! I usually find myself "vacationing" in my own city only when people come to visit but it makes sense to play tourist yourself so you will know which attractions to share with your out of town guests! I especially like your suggestion to try 3 new restaurants. Too often we get in a rut and keep going back to the same spots. Visiting from SITS Sharefest. I think we forget all the wonderful things there are to do at home until we have visitors. I always feel like I have no ideas when people come so now I have a better understanding of my own city since I have been "Vacationing" all summer! Thanks for stopping by! It is great to show your own city some love! Like you said we do live in these places for a reason! Thanks for stopping by!